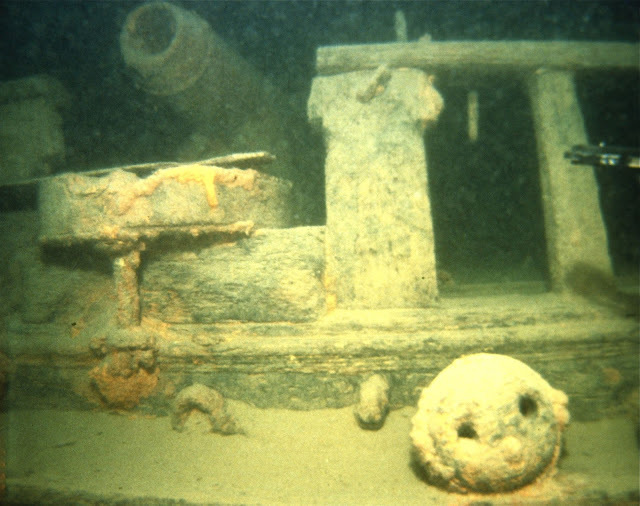 The Old Northwest Notebook: Wrecks of the Hamilton and Scourge, Lost Warships of the War of 1812. 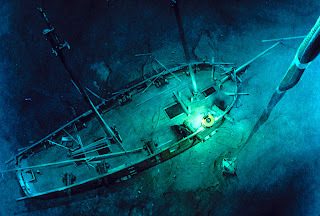 Wrecks of the Hamilton and Scourge, Lost Warships of the War of 1812. On August 8, 1813, two American warships were sailing off Fourteen Mile Creek in Lake Ontario. The USS Scourge and USS Hamilton were schooner rigged vessels, converted from merchantmen to join the small US fleet on the lower Great Lakes. Both schooners were heavily armed. The Scourge mounted four 6 pounder and four 4 pounder cannons, while the Hamilton boasted a 32 pounder gun and eight 12 pounder carronades. Each gun could weigh more than a ton, and all this weight lying on the main deck made the warships top heavy. Even worse, the weather on the Great Lakes is famously fickle, blowing fair one minute and then conjuring vicious squalls and devastating short-wavelength chop the next. On that August day, the two schooners were caught in one of these sudden squalls. 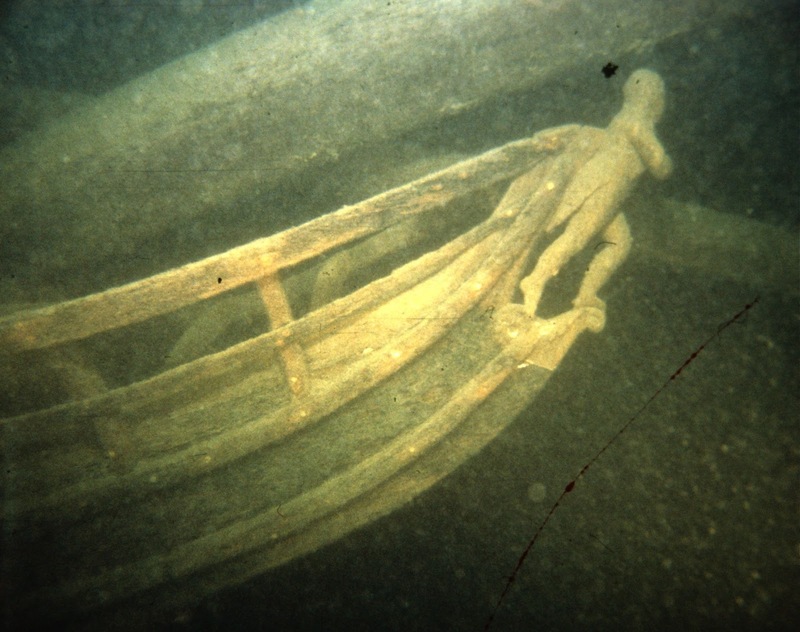 Both ships capsized, dragging over eighty men into the cold, deep lake waters with them. Only 16 men survived. 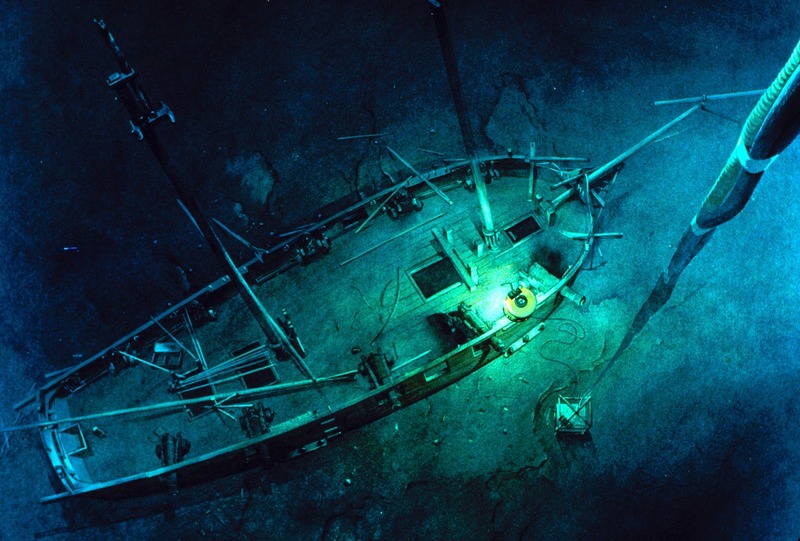 It wasn't until 1979 that the two wrecks were discovered. Because of the depth and the temperature of the lake bed, the remains of both schooners and crew were extremely well-preserved. 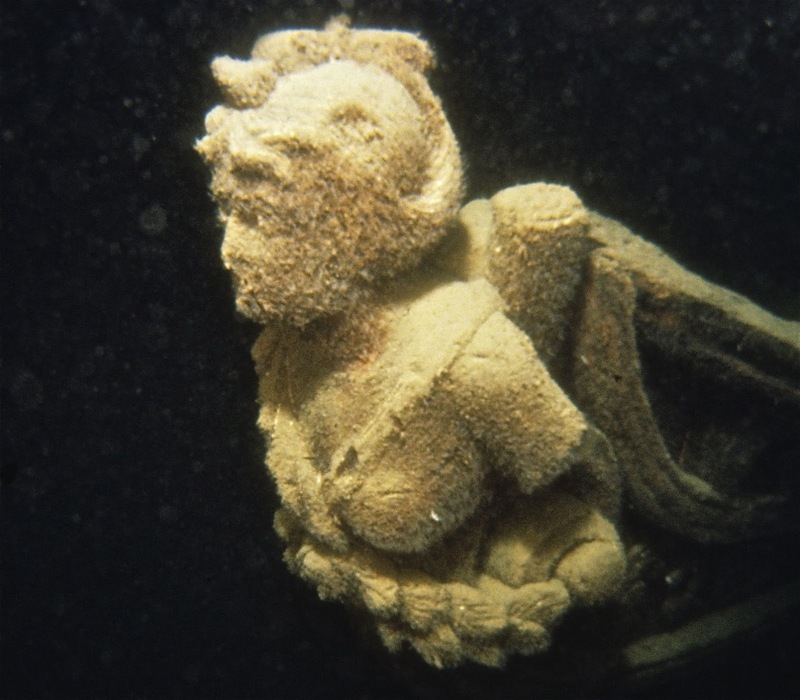 An expedition in the early 1980s surveyed the wreck with an ROV, and pictures from this survey were published in the National Geographic magazine in 1983. 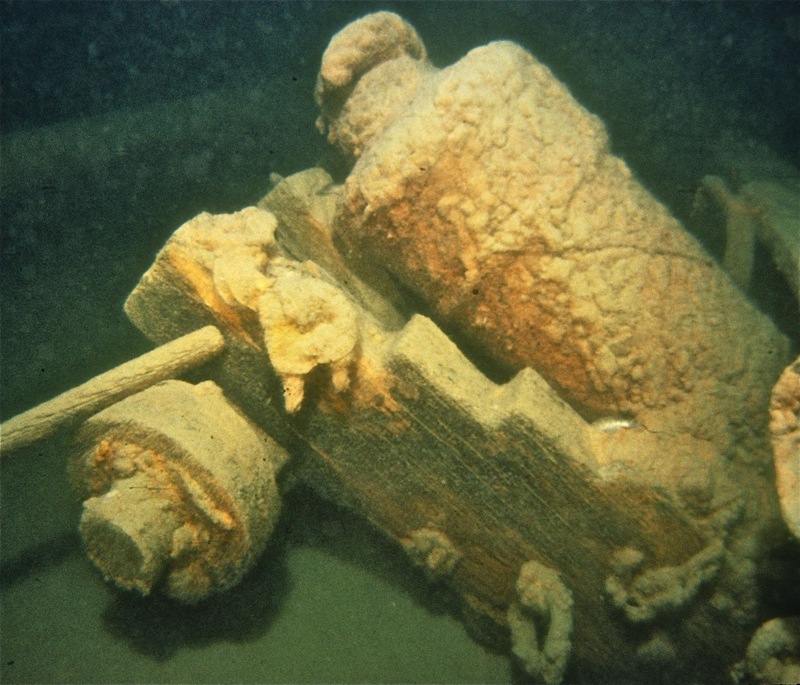 One of the 12-pounder carronades mounted on its characteristic pivot at the rail of the Hamilton. 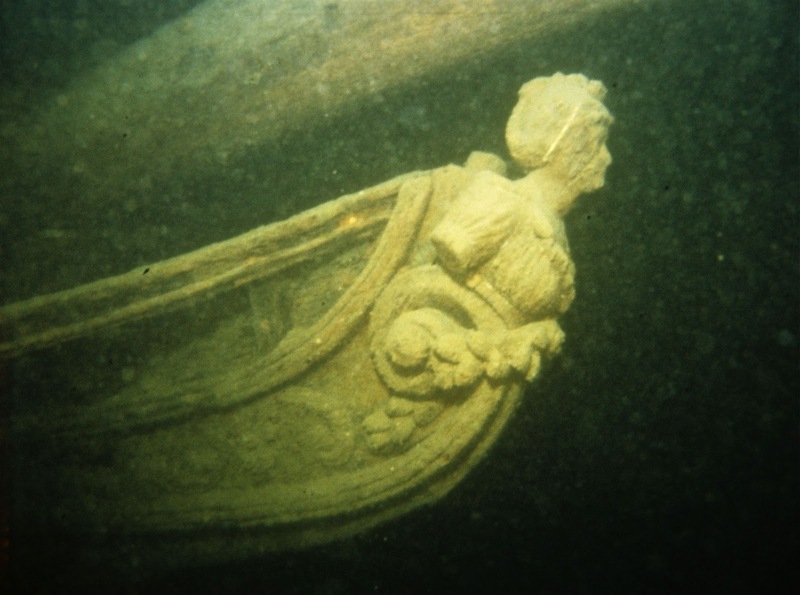 Figurehead of the Hamilton. The ill-fated statesman strides forward through Ontario's chilly depths. A gun. Probably one of the 4 or 6-pounders on either vessel. Another gun upended at its port. 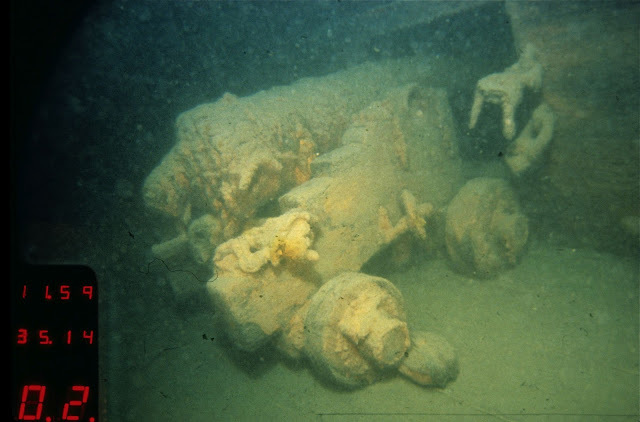 The carriages, tools, and fittings on both guns are shockingly well preserved. For comparison: an original 6-pounder in the exhibit at Perry's Victory Memorial at Put-In-Bay. This carriage is a reproduction. 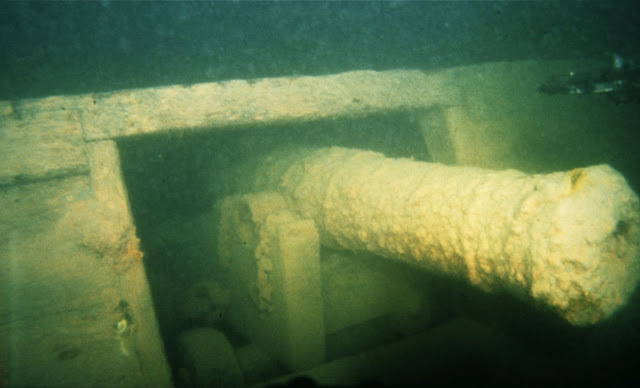 Another gun at its port. Another view of the eery visage of the Scourge herself.